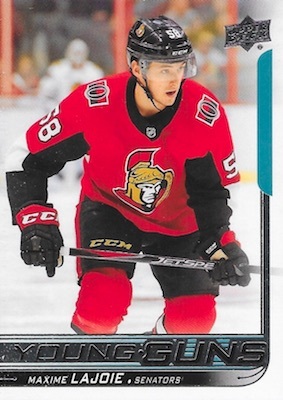 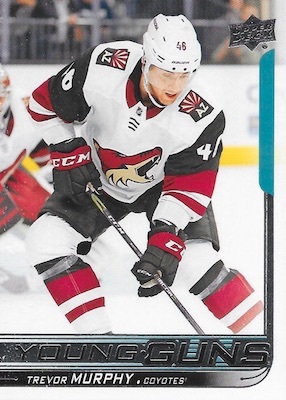 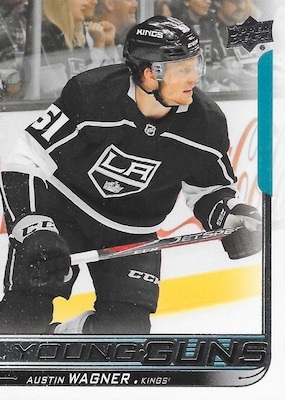 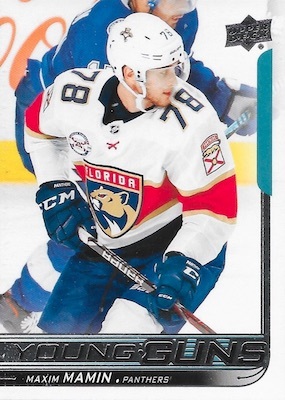 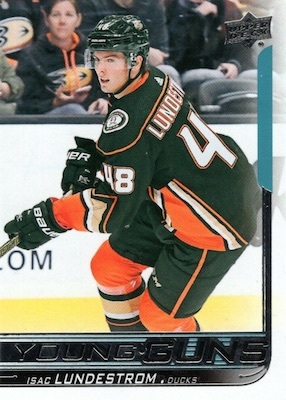 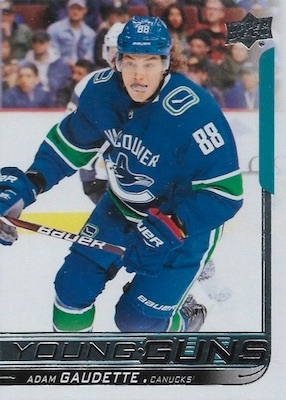 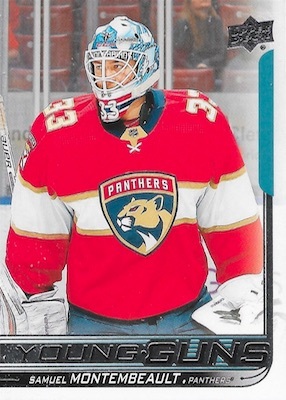 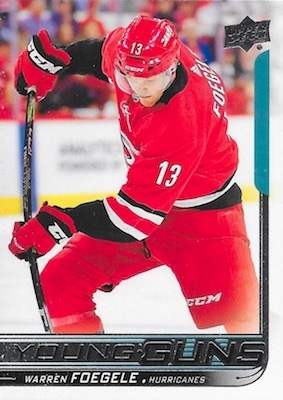 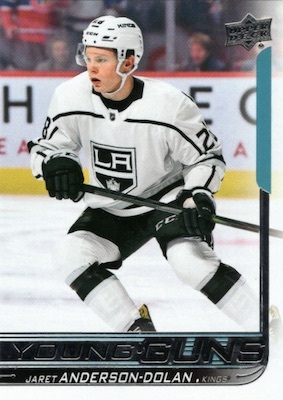 With the '18-19 NHL season underway, the 2018-19 Upper Deck Young Guns rookie cards are getting plenty of hobby love. 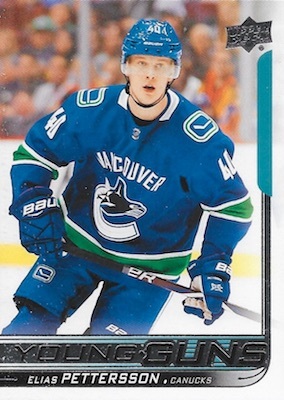 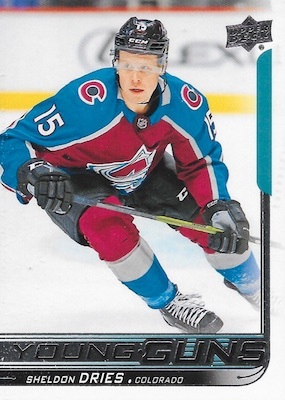 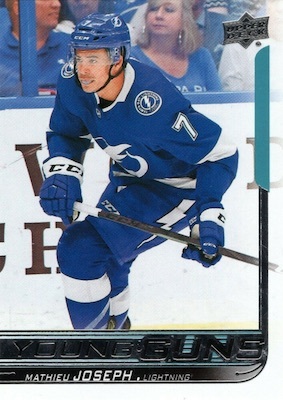 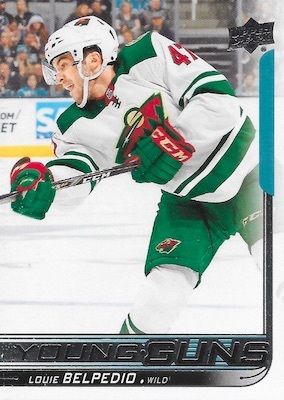 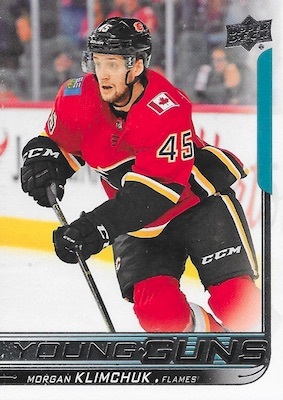 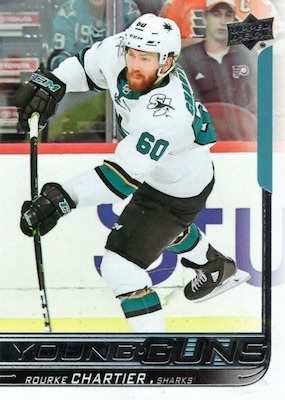 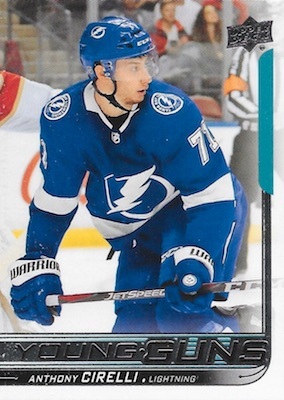 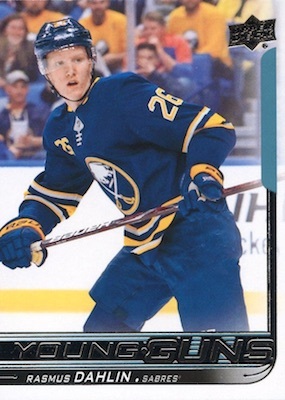 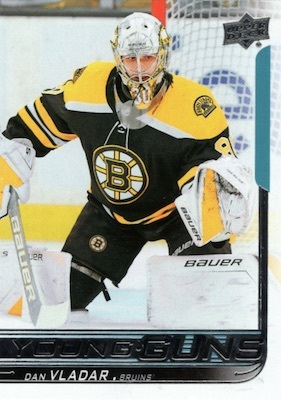 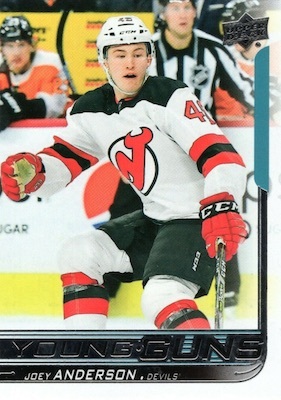 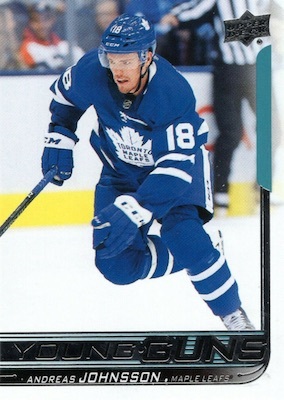 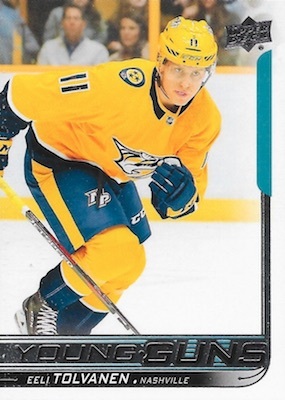 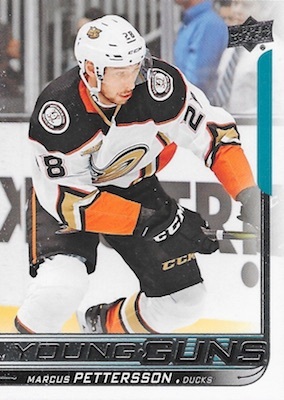 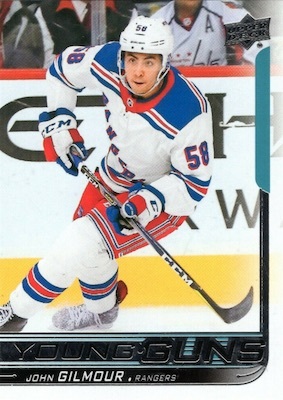 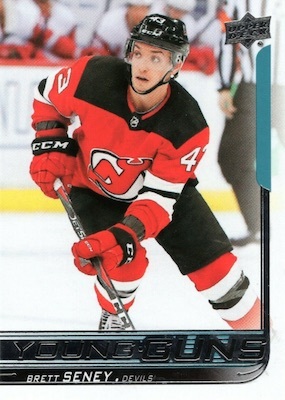 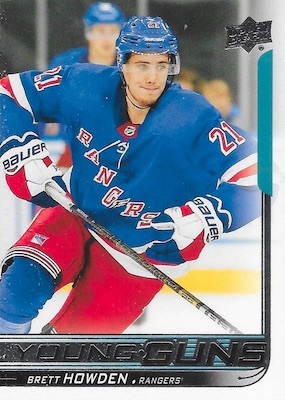 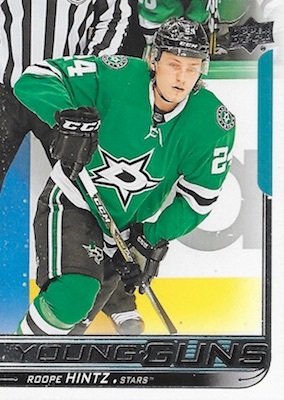 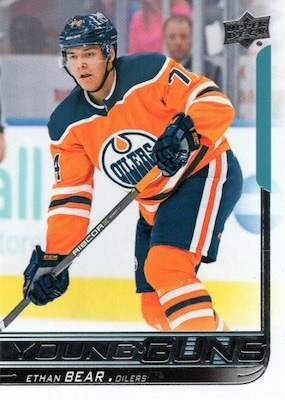 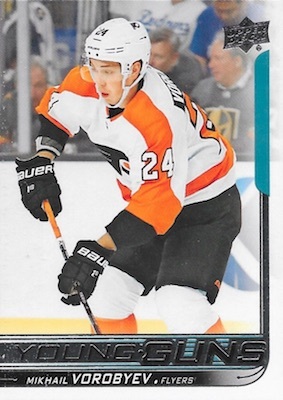 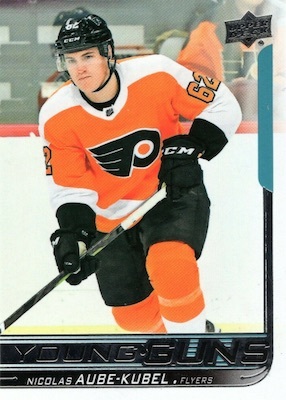 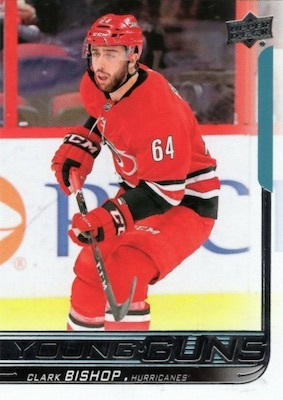 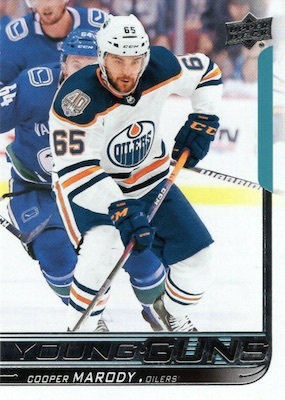 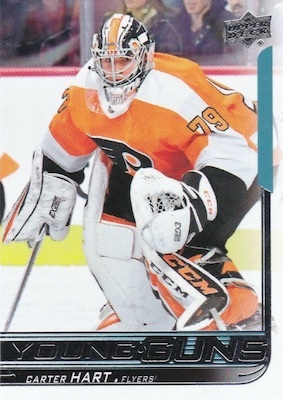 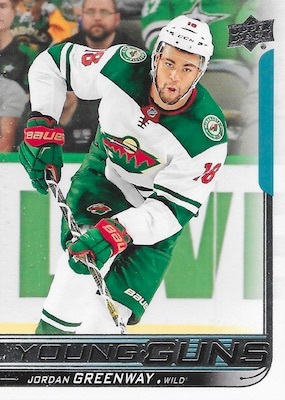 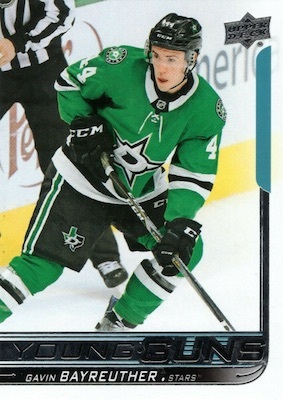 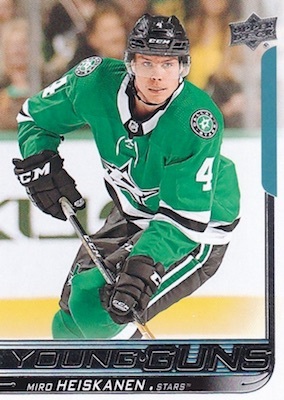 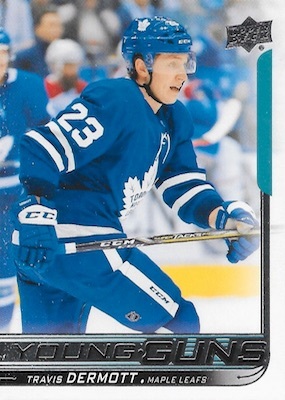 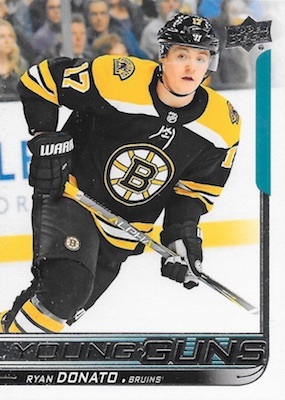 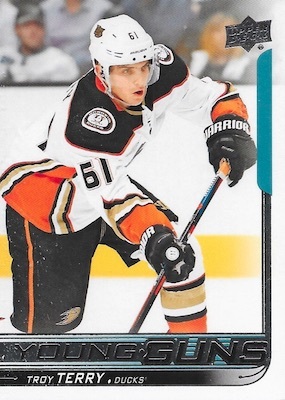 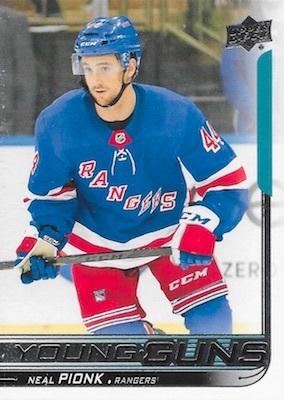 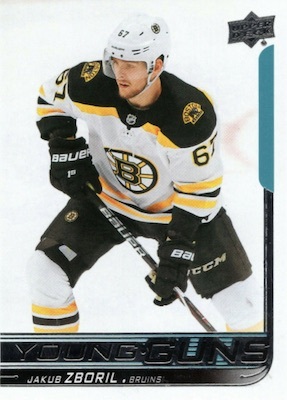 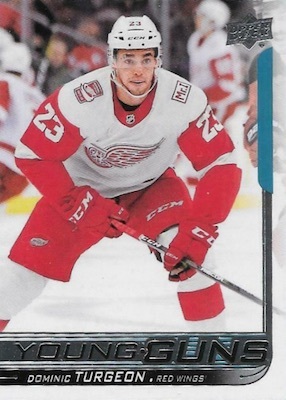 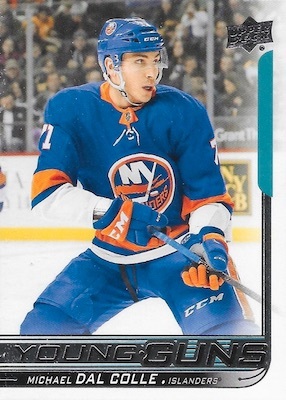 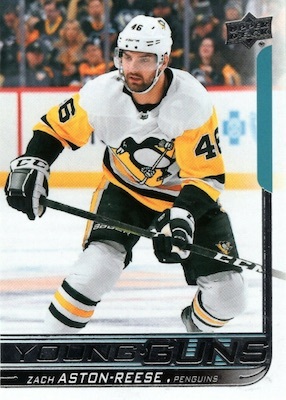 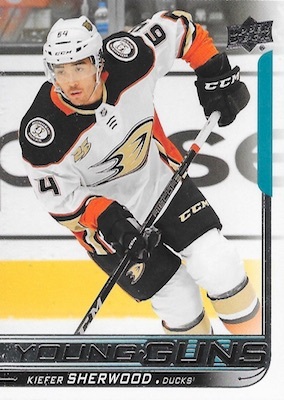 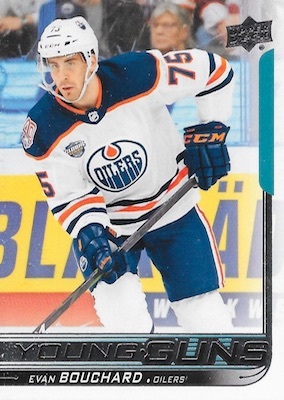 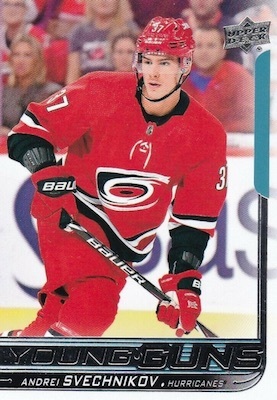 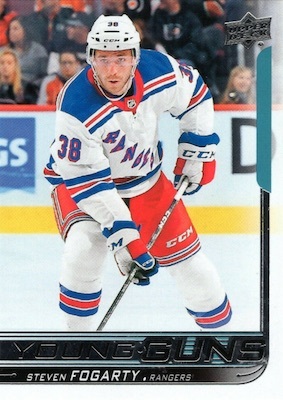 Although pretty simple by today's standards, the famed Young Guns set continues to command the attention of the hockey card market. 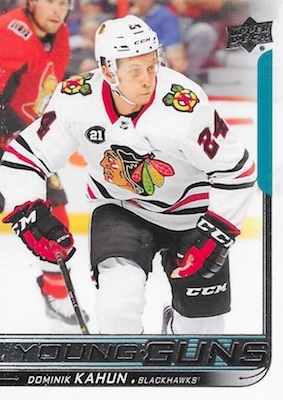 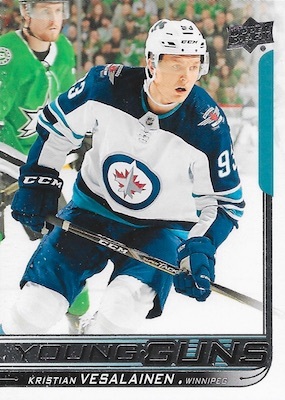 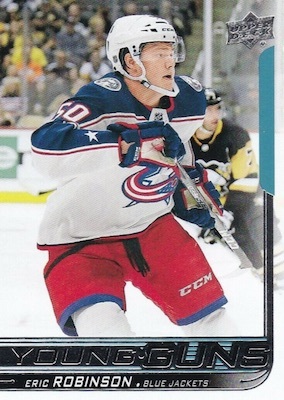 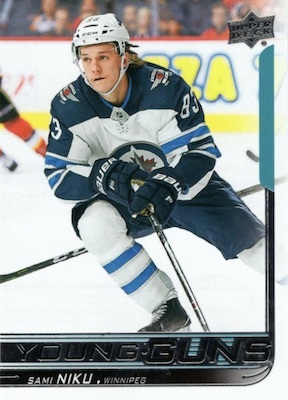 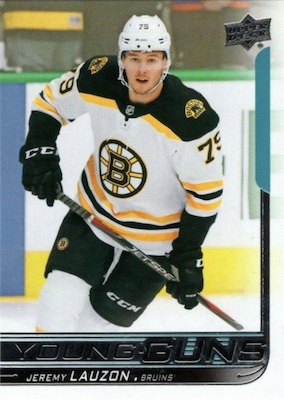 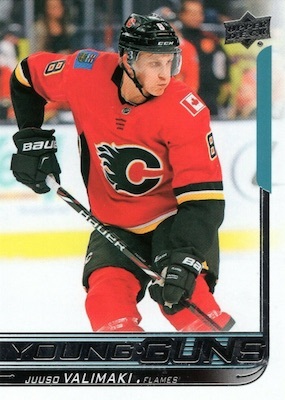 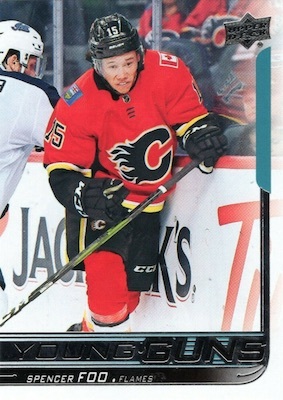 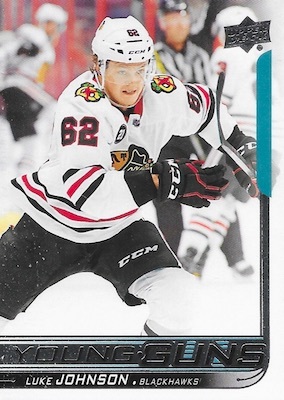 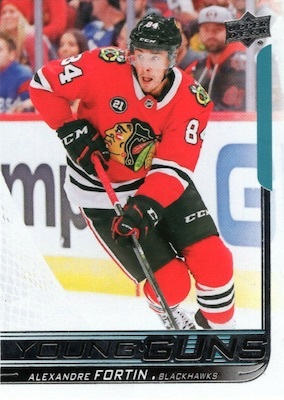 As the iconic rookie card option from the flagship NHL release, the bulk of the 2018-19 Upper Deck Young Guns checklist drops in 2018-19 Upper Deck Series 1 and Series 2 Hockey. 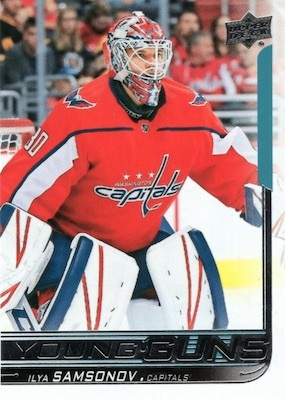 Naturally, Series 1 is the first up with 50 cards added to the storied line starting in early November. 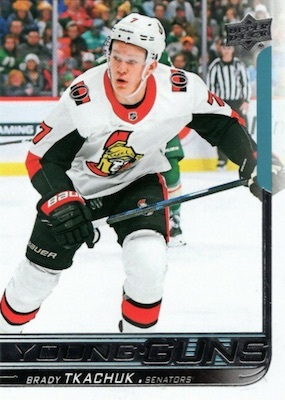 Series 2 releases in February. 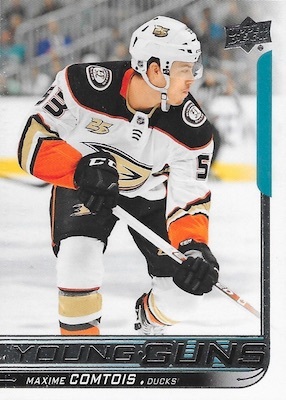 Although not especially rare at overall odds of 1:4 packs, the YG cards tend to be some of the most popular rookies every year and many become quite valuable. 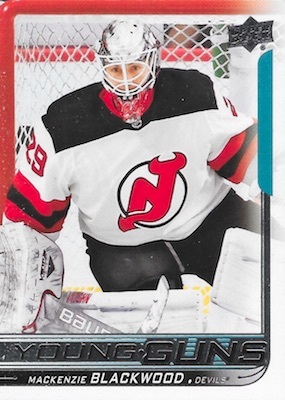 There are also the limited parallels, including Clear Cut (1:72), Exclusives (#/100) and High Gloss (#/10). 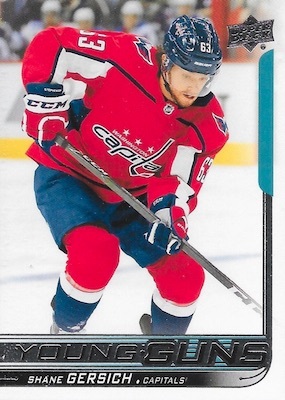 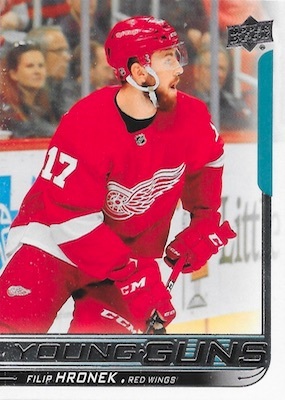 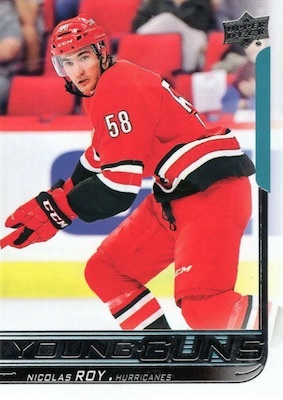 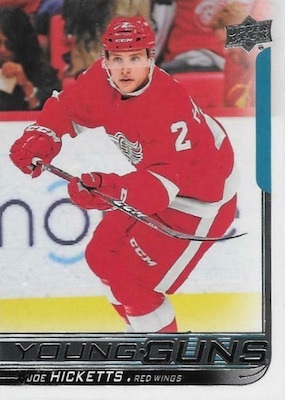 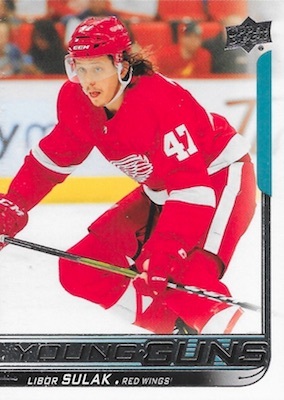 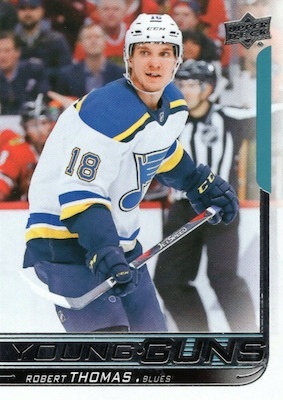 In addition, the UD Canvas Young Guns cards average 1:48 packs. 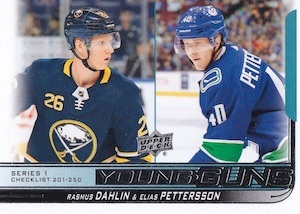 Series 1 has 2018's first-overall pick, Rasmus Dahlin, and 2017's fifth-overall pick, Elias Pettersson. 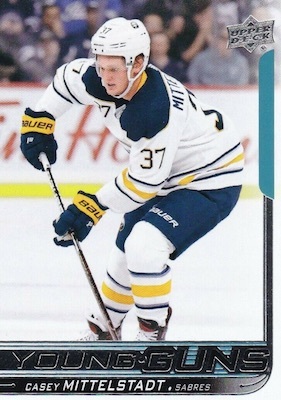 Upper Deck confirmed that the Young Guns rookie card for Casey Mittelstadt is releasing in Series 2. 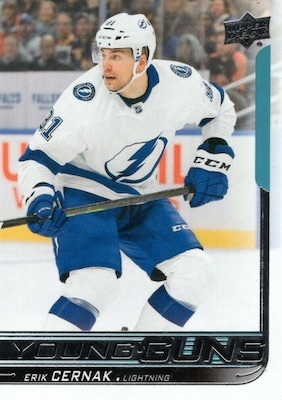 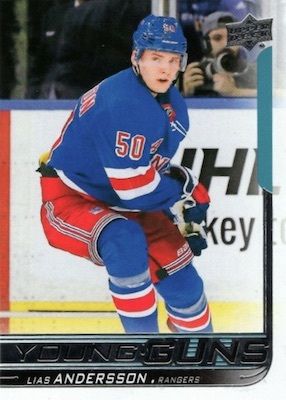 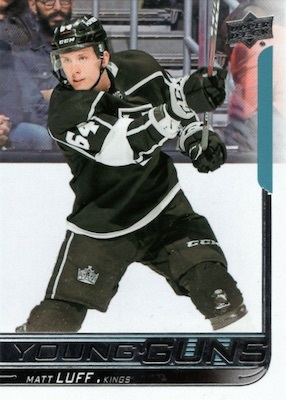 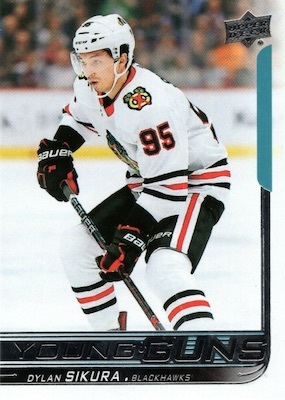 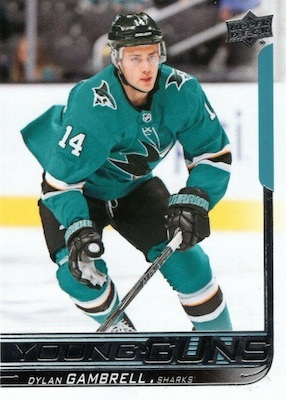 He is, however, in the Series 1 set for the UD Canvas Young Guns. 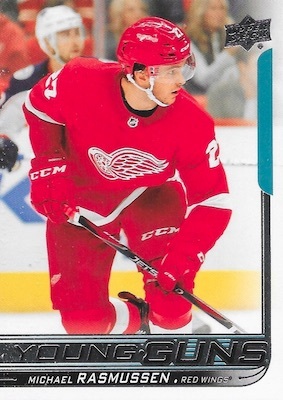 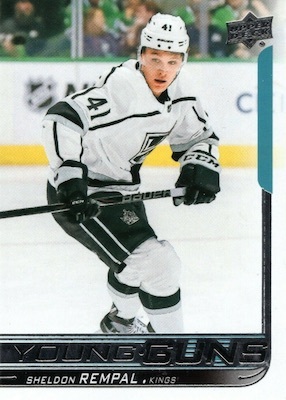 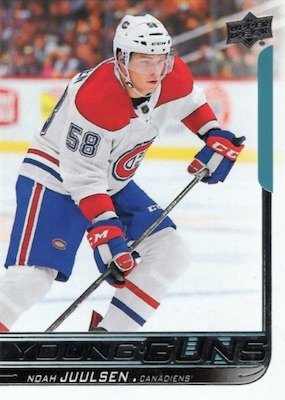 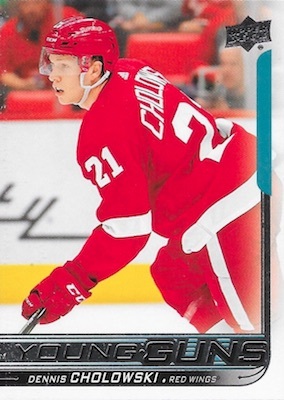 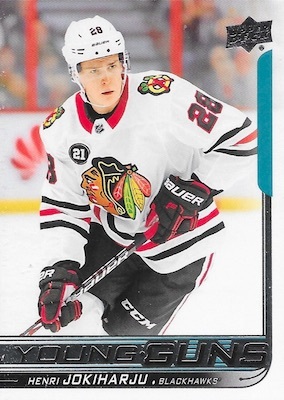 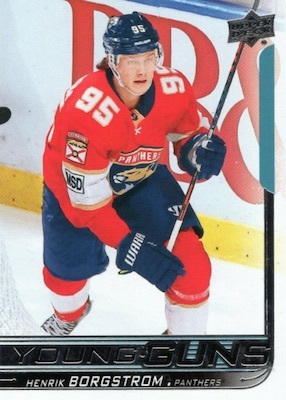 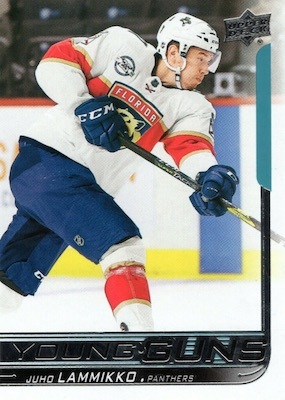 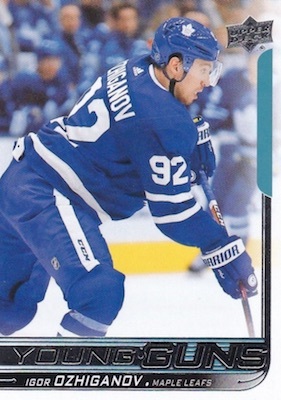 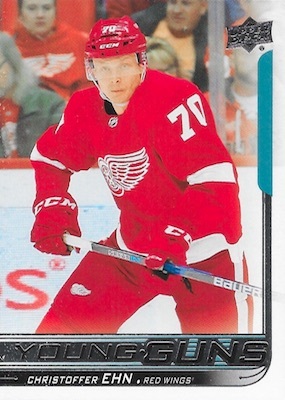 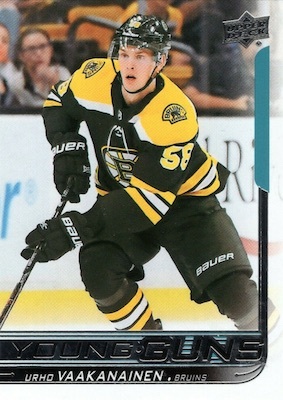 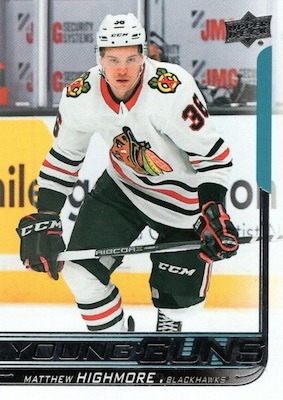 Series 2 also has the YG rookie card for Andrei Svechnikov. 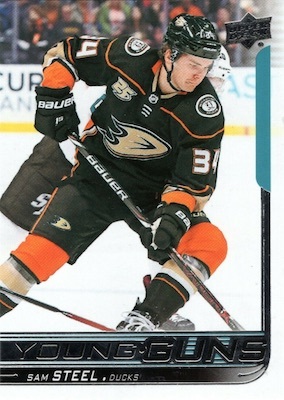 Check out the 2018-19 Young Guns guide below. 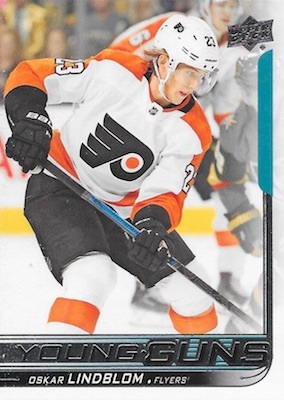 The full checklist for both the base Young Guns and UD Canvas Young Guns, including a breakdown by team listing, is waiting on the "Checklist" tab. 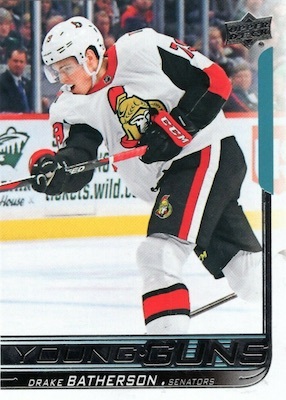 Images, when available, are shown on the "Gallery" tab. 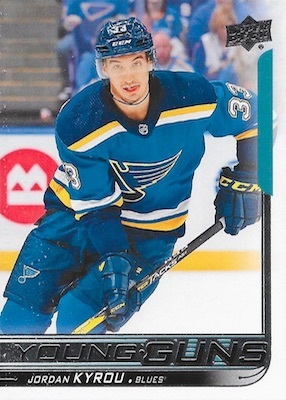 Buy complete 2018-19 Upper Deck Young Guns sets on eBay. 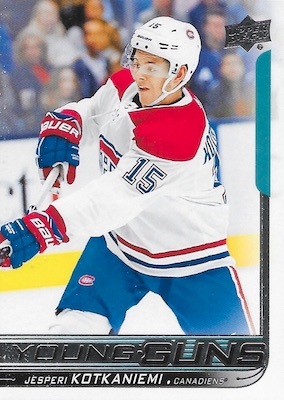 Use the player links below to shop for specific cards or check current market values on eBay. 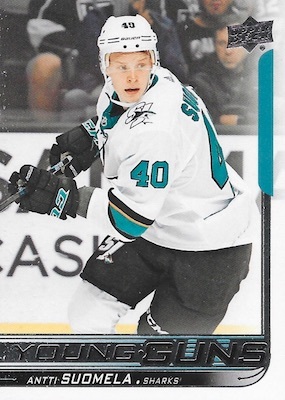 100 cards. 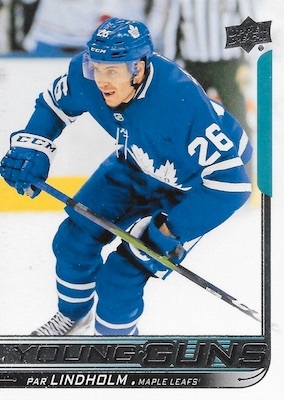 1:4 packs. 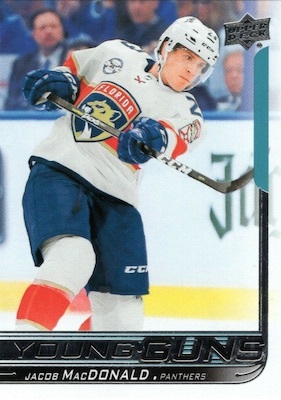 Found in UD Series 1 and Series 2. 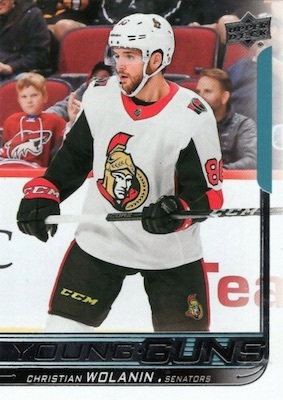 PARALLEL CARDS: Clear Cut (1:360 Hobby), Exclusives #/100 (Hobby/ePack), High Gloss #/10 (Hobby/ePack). 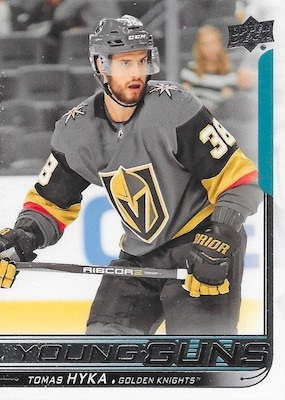 S1 ePACK PARALLELS: Silver Foil, Speckled Rainbow Foil. 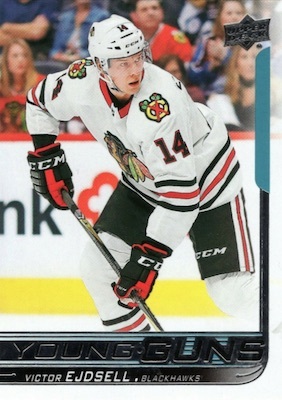 UD Canvas YG odds - 1:48 Hobby/ePack/Retail/Tin; 1:96 Blaster. 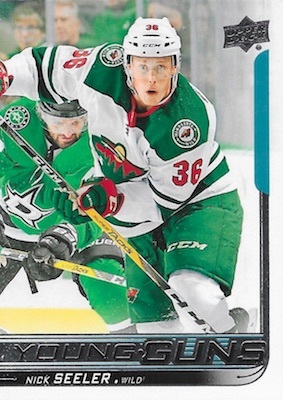 All Young Guns grouped by team. 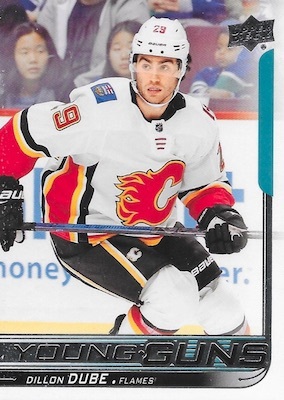 These are the ePack exclusives. Per the UD site: Collect and combine 5 copies of any individual Base Set – Young Guns (#201-250) card to receive an e-Pack exclusive Silver Foil parallel of that card with the ability to have the physical card mailed to you. 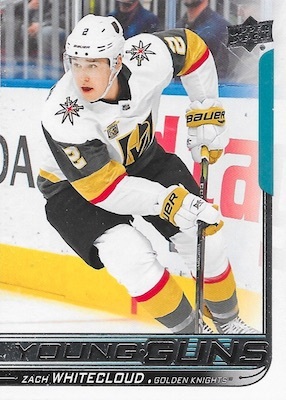 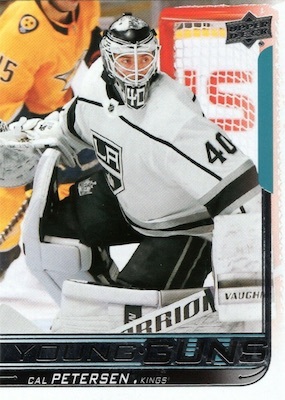 Then, collect and combine 3 copies of any individual 2018-19 Upper Deck Series 1 Hockey Young Guns Silver Foil Parallel (#201-250) to receive an e-Pack exclusive Speckled Rainbow Foil parallel of that card with the ability to have the physical card mailed to you.